I built Hawi three years ago, and many of the component choices I made back then have better alternatives now. This article shows the upgrades I did, and also adds a more detailed description of the electronics I used. http://www.robidouille.com Danger Monkey is back. Last time I showed Danger Monkey it was moving on my test setup. You can see that video on my website or my youtube channel This time I went to test it on-site at the office. This wooden rail makes a circle around the office and is around 9 feet above the ground. Needless to say, falling off the rail is not a good idea. 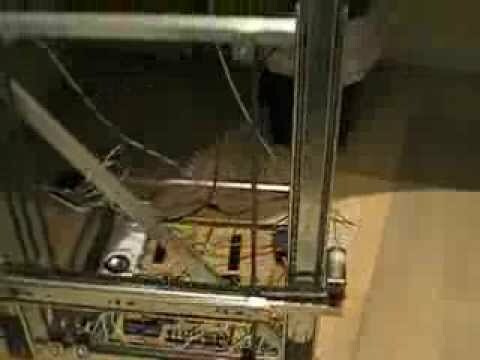 http://www.robidouille.com This new robot is called Danger Monkey. Its goal is to be able move on a horizontal wooden 2 by 4 stud. To complicate things a little however there are obstacles as you can see, and they that need to be avoided. I've tried several designs, some with wheels, and others with arms. My 2 arm version is working best so far. 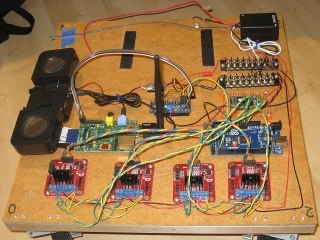 I'm using an Arduino as microcontroller. The servos are cheap Hitec HS322-HD. 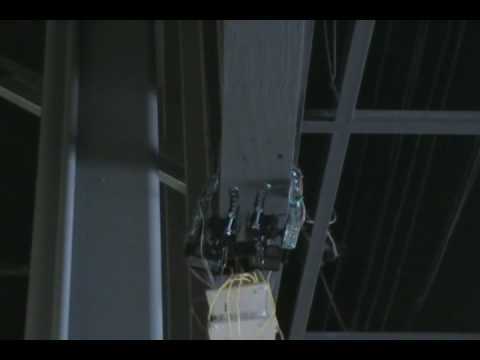 Each arm has 2 lever-switches to detect pressure in front and below. This actually comes from a challenge at the office, where we have a much bigger version of this that goes around the ceiling of our building. Next step is to see if it works there. Twitter: Jodi got a silver medal at robogames ! Hurray ! Jodi got a silver medal at robogames ! Hurray ! http://www.robidouille.com The goal of phase 2 is to have Jodi find the target and push it off the table without itself falling off. 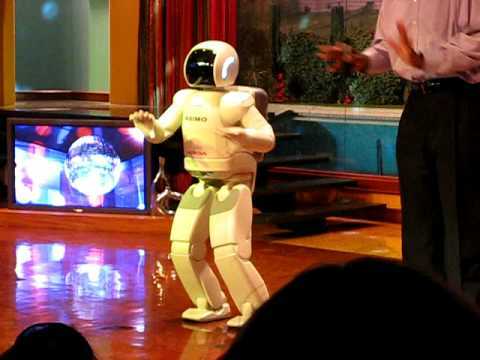 After being entirely remote controlled, Hawi makes its first steps (or rather wheel turns) on its own. I did lot of software upgrades to achieve this, some of which are not necessary right now, but will hopefully pay in the future. http://www.robidouille.com Jodi is my first attempt at the HBRC Challenge. 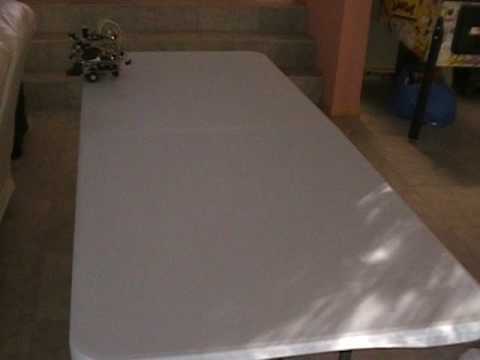 For Phase1 it has to stay on the table. As you can notice it has more sensors than necessary for this. They are meant to be used for Phases 2 and 3.
http://www.robidouille.com Hawi has 4 motorized wheels. 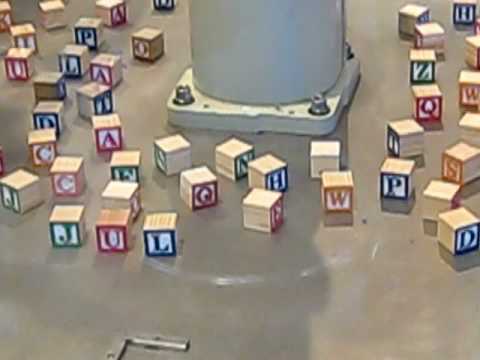 Each wheel has it's own DC motor and a servo that controls it's orientation. So it can turn like a car. But also turn all it's wheels and move sideways. Planetary gearboxes on the motors allow for high torque and precise control, in spite of it's weight. And finally setting the wheels at 45 degrees allows Hawi to spin. 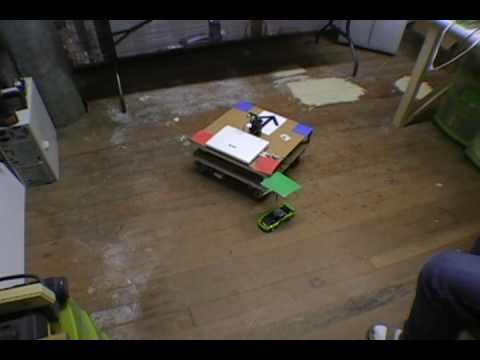 Hawi is remote controlled for now, but the goal is to make it autonomous as soon as possible. YouTube: Look Ma, no encoders ! Look Ma, no encoders ! 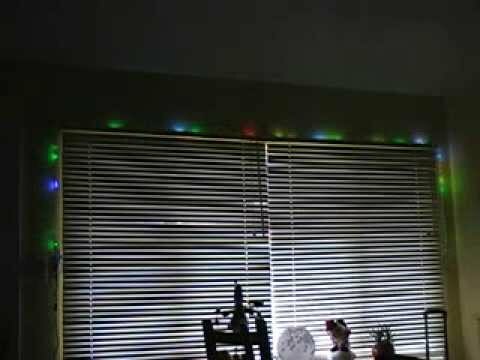 YouTube: Robot Arm Phase4: It does stuff ! 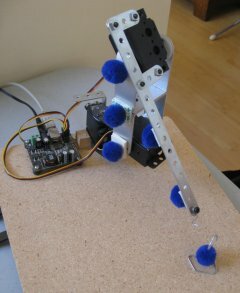 Robot Arm Phase4: It does stuff ! Two industrial robots are now employed as noodle chefs in Nagoya, Japan. Look out Ichiro Suzuki and Daisuke Matsuzaka. 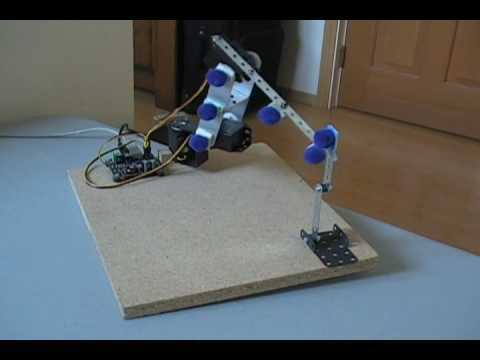 ..
YouTube: Robot Arm Phase 3 : It's stable ! Robot Arm Phase 3 : It's stable ! 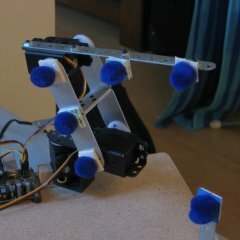 Robot Arm : Phase 3 - It's stable ! The main problem in the last version was keeping track of my blue points. The initialization code I had in phases 1 and 2 is no longer needed now. Instead I added 2 extra blue points. This gives me more information about the structure of the arm, and allows me to identify the points using only a single frame. 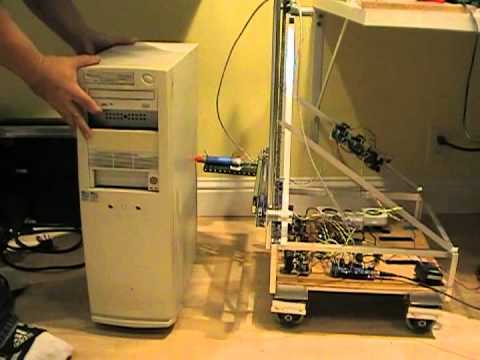 YouTube: Robot Arm Phase2: Let's kick it up a degree ! Robot Arm Phase2: Let's kick it up a degree ! 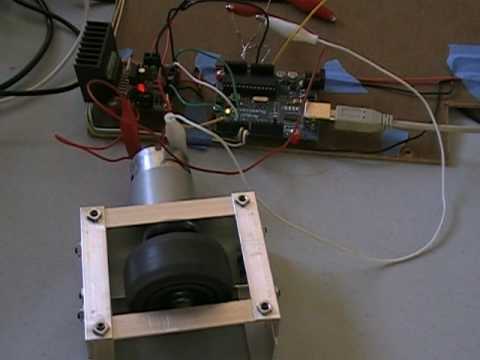 Robot Arm : Phase 2 - Let's kick it up a degree ! This is an evolution of my initial robot arm. I added an extra servo at the base, thus bumping up the degrees of freedom to 3. This introduces a new challenge as the arm moves in 3D now. 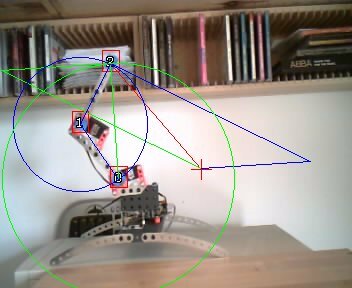 To obtain 3D coordinates, I use 2 cameras and triangulate the 2D coordinates into 3D coordinates. Here is a more detailed look at the algorithm used and math involved in creating my robot arm. 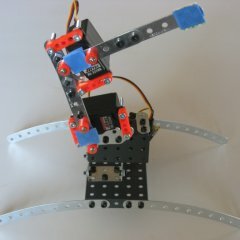 This robot arm is very simplistic, is uses only 2 servos, one for the “shoulder” and one for the “elbow”. Its main purpose is to experiment with ways to control it.